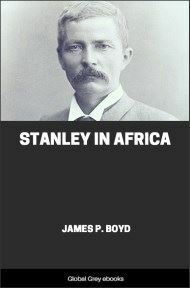 Volume I of II. 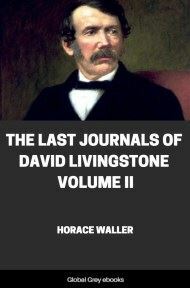 This book is made up of David Livingstone's journals from 1865 up until his death. It is then carried on by his servants, or as the book puts it; 'continued by a narrative of his last moments and sufferings obtained from his faithful servants'. 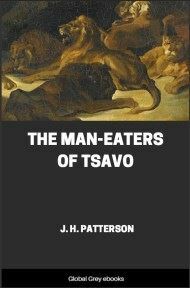 It's a fascinating insight into Livingstone's travels, as he writes about the things he saw, illnesses that struck, slavery and more. TO HIS HIGHNESS SEJUEL MAJID, SULTAN OF ZANZIBAR. "YOUR HIGHNESS,—I trust that this will find you in the enjoyment of health and happiness. "I have requested my friend, Dr. David Livingstone, who is already personally well and favourably known to your Highness, to convey to you the assurance of the continual friendship and goodwill of Her Majesty's Government in India. "Your Highness is already aware of the benevolent objects of Dr. Livingstone's life and labours, and I feel assured that your Highness will continue to him the favour and protection which you have already shown to him on former occasions, and that your Highness will direct every aid to be given him within your Highness's dominions which may tend to further the philanthropic designs to which he has devoted himself, and which, as your Highness is aware, are viewed with the warmest interest by Her Majesty's Government both in India and England. "I trust your Highness will favour me with continued accounts of your good health and welfare. "BOMBAY CASTLE, 2nd January, 1866." When we arrived Dr. Seward, the Acting Consul, was absent at the Seychelles on account of serious failure of health: Mr. Schultz, however, was representing him, but he too was at the time away. Dr. Seward was expected back daily, and he did arrive on the 31st. I requested a private interview with the Sultan, and on the following day (29th) called and told him the nature of my commission to his Highness. He was very gracious, and seemed pleased with the gift, as well he might, for the Thule is fitted up in the most gorgeous manner. We asked a few days to put her in perfect order, and this being the Ramadân, or fasting month, he was all the more willing to defer a visit to the vessel. Dr. Seward arranged to have an audience with the Sultan, to carry out his instructions, which were to present me in a formal manner; Captain Bradshaw of the Wasp, with Captain Leatham of the Vigilant, and Bishop Tozer, were to accompany us in full dress, but the Sultan had a toothache and gumboil, and could not receive us; he, however, placed one of his houses at my disposal, and appointed a man who speaks English to furnish board for my men and me, and also for Captain Brebner, of the Thule, and his men. 6th February, 1866.—The Sultan being still unable to come, partly on account of toothache and partly on account of Ramadân, he sent his commodore, Captain Abdullah, to receive the Thule. When the English flag was hauled down in the Thule, it went up to the mainmast of the Iskander Shah, and was saluted by twenty-one guns; then the Wasp saluted the Arab flag with an equal number, which honour being duly acknowledged by a second royal salute from the Iskander Shah, Captain Abdullah's frigate, the ceremony ended. Next day, the 7th, we were received by the Sultan, and through his interpreter, I told him that his friend, the Governor of Bombay, had lately visited the South Mahratta Princes, and had pressed on them the necessity of education; the world was moving on, and those who neglected to acquire knowledge would soon find that power slipped through their fingers, and that the Bombay Government, in presenting his Highness with a portion of steam power, showed its desire to impart one of the greatest improvements of modern times, not desiring to monopolize power, but hoping to lift up others with themselves, and I wished him to live a hundred years and enjoy all happiness. The idea was borrowed partly from Sir Bartle Frere's addresses, because I thought it would have more weight if he heard a little from that source than if it emanated from myself. He was very anxious that Captain Brebner and his men, in returning to India, should take a passage from him in the Nadir Shah, one of his men-of-war, and though he had already placed his things aboard the Vigilant, to proceed to Seychelles, and thence to Bombay, we persuaded Captain Brebner to accept his Highness's hospitality. He had evidently set his heart on sending them back with suitable honours, and an hour after consent was given to go by the Nadir Shah, he signed an order for the money to fit her out.